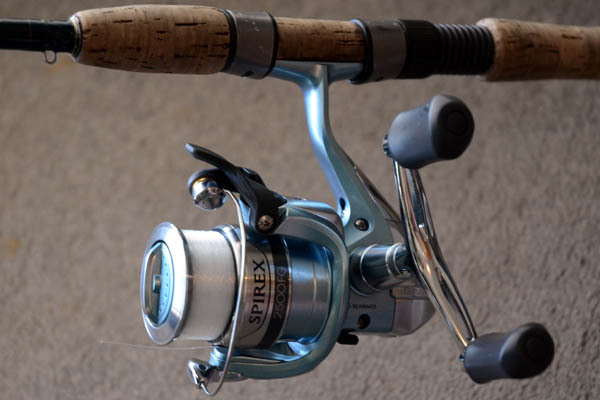 I recently purchased a new Shimano Spirex 2500FG. I’d still be using my old Spirex 2000FD which has served me very well for about 8-9 years now expect I had a slight mishap recently in rough water and bent the handle (full disclosure – I sat on it – bummer). I managed to mostly straighten it out and everything else still works but I figured I get myself a new one and pass this one to my youngest son, much as I have passed on my 25 Year old Shimano Aero GX A3000R to my oldest son, a reel he still uses today. The longevity of these moderately priced reels are one of the reasons I keep buying them. The second reason is that I’m hooked on the QuickFire II casting system. 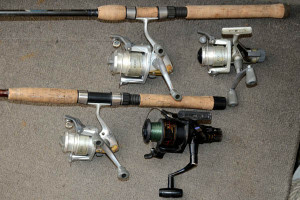 The Aero GX A3000R was my first true spinning reel and using the QuickFire system became second nature to me. Now fishing without it just seems weird. I love how it allows for one-handed casting, freeing up my other hand momentarily for other duties (generally boat control, but also depth finder tuning, eating, coffee, the odd cigar, etc.). The one knock against this system from some has always been the lack of “instantaneous anti-reverse” – it does have anti-reverse but you have to move the trigger back to the top position for it to be ready. I’ve never found this to be a big issue for most applications. I did contemplate buying a separate reel for jigging but haven’t done so yet. I find the front drag system to be smoother than the rear drag (“Fighting Drag”) and have had no issue adjusting it on the fly as needed. The action is smooth but these are slightly heavier reels than the much more expensive models (10.6 ounces for the Spirex 2500 ($59.99) versus 7.7 ounces for the Stella 2500 ($799.99). I guess I could take my watch off to compensate for that extra 2.9 ounces of weight. All that extra cash in my pocket might also throw me off balance – could be a problem. The price has dropped for this version compared to what I paid for the previous model years ago and my hope is that the build quality of this model hasn’t been sacrificed for price. Only time on the water will tell.